....Mud Pie products, that is. I've written before about how much I love these little products and how cute they are. While we were on the road, I found two more pieces, well, actually 4 if you count the spoons. I just think it's adorable that you get a little message when you empty the contents from the spoon..
Let's salsa...how cute is that?!?! 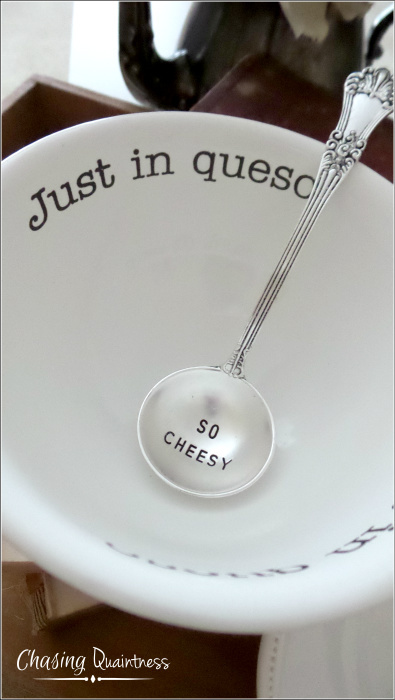 Yummmmm, cheesy! Two messages with this set...a two-fer, right up my alley! 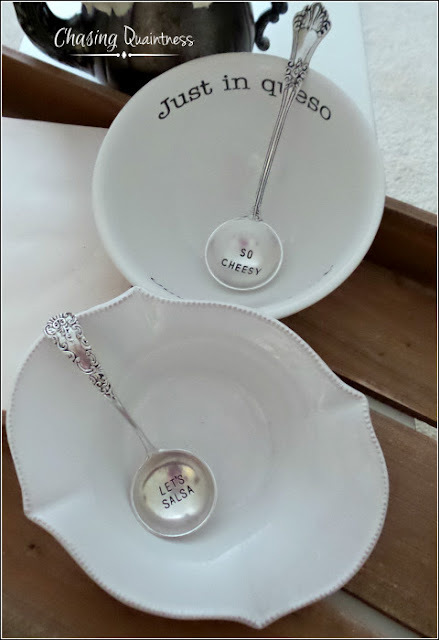 They have so many adorable products, and while the little messages probably seem corny....hey, I wonder if they have corn cob holders that have "so corny" imprinted on them....I'm off to check that out and will let you now what I find! Very cute. I must go and check Mud Pie out. Thanks for letting us in on such cute items! 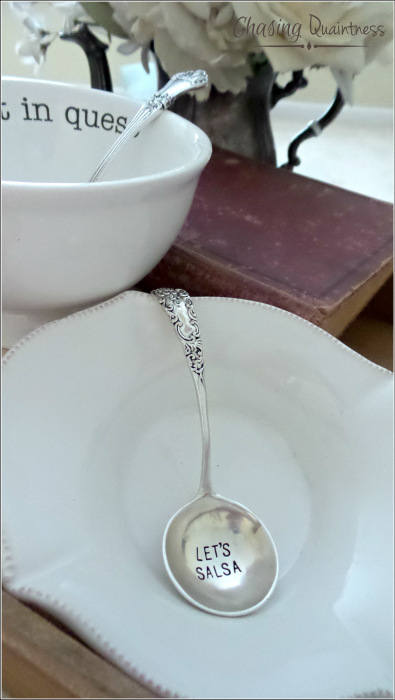 I love the stamped spoon items! I think they are adorable. It's just something cute, different and pretty neat and our guests always get a kick out of them! :-) I hope you have a wonderful weekend girl and take care of yourself. Sent you an email earlier! Hugs!! I have a couple of these beautiful little cute bowls and spoons. Love all the sayings. We actually have a cute store near us that sells the line of Mudd and they always have the cutest selection. Happy Friday. Enjoy the week end. Aren't they just adorable!!! I love the little sayings also and they have so many cute things to choose from! I hope you have a great day and wonderful weekend Kris! Well, you’ve seen my craft project flops. There’s no way I’m going to kill beautiful silverware with my tortuous techniques! :-) Thank you, I love them! Hugs!! I love these! So sweet. I can see everyone in my house claiming them. I just think they are adorable and pick up pieces whenever I can. Thank you Deb! Hope you have a great weekend! I did finally find a store in the area which sells Mud Pie, but it closed. A corn dish - Gobs of Cobs. These are darling! I'm a sucker for "words" too. Thank you ma’am. I grab a few up every time I see them!